BMI saluted the top European songwriters and publishers in the pop, country, dance, Latin, college and film/TV music genres at its 2004 London Awards on October 6. The gala dinner and awards ceremony, which honored the most performed songs on U.S. radio and television written by members of its foreign sister societies, was hosted by BMI President & CEO Del Bryant along with President Emeritus Frances Preston and Senior Vice President Phil Graham. The invitation-only event was held in the Ballroom of London's Dorchester Hotel. 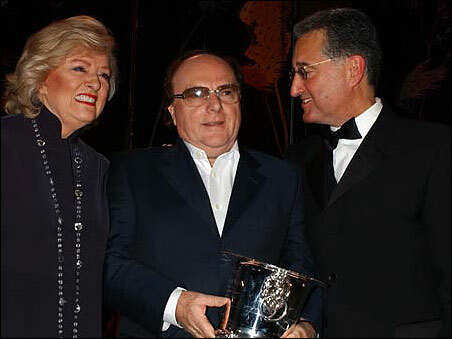 "Forever And For Always," written and recorded by multiple BMI Award-winning artist Shania Twain (PRS), was named Song of the Year and received the organization's highest accolade, the Robert S. Musel Award, named for the late Robert Musel, BMI's long-time UK consultant. "Forever," from Shania's 10-times platinum CD UP!, is her third Song of the Year win; her mega-hit "You're Still The One" earned her the title at both the 1999 BMI Pop and Country Awards. She was also named BMI Songwriter of the Year at both the 1999 and 2000 Pop and Country Awards and now owns a total of 26 BMI Awards. Another highlight of the gala evening was a special tribute to Van Morrison, who was honored as a BMI ICON for his "enduring influence on generations of music makers." The Irish rocker joins a distinguished list of honorees that includes Al Green, Brian Wilson, Isaac Hayes and Dolly Parton, among others. With a prolific career that spans nearly 40 years, Morrison has penned such classics as "Brown-Eyed Girl," "Gloria," "Domino" and "Moondance." "All The Things She Said," written by Trevor Horn (PRS), Elena Kiper (RAO), Ivan Shapovalov (RAO) and Martin Kierszenbaum, and published by EMI Music Publishing Ltd. (PRS), Neformat (RAO) and Perfect Songs Ltd. (PRS), was named College Song of the Year for the most performances on American college radio. The international crossover hit, recorded by Russian teen pop duo t.A.T.u., also received a BMI Pop Award. Million-Air certificates were presented throughout the evening in recognition of the songs that have had 2 million or more U.S. radio and television performances (two million spins is the equivalent of more than 11.4 years of continuous airplay). Several classics written by the late John Lennon (PRS) achieved multi-Million-Air status including the timeless Beatles song "Yesterday," which reached the 8 million performance plateau. His "Imagine" earned a 5 million performance award, "All My Loving" and "I Want To Hold Your Hand" each earned 3 million performance awards, and "I Saw Her Standing There," "Lady Madonna" and "Nowhere Man" each earned certificates for 2 million US performances. Song of the Year winner Shania Twain was also recognized with multiple Million-Air certificates including a 5 million performance award for "You're Still The One," 3 million performance awards for "From This Moment On," "Man! I Feel Like a Woman" and "That Don't Impress Me Much," and a 2 million performance award for "Honey, I'm Home." She now has 14 Million-Air songs in her BMI catalog for a total of over 37 million broadcast performances. Also earning several Million-Air awards this were Elton John (PRS) and writing partner Bernie Taupin for "Candle In The Wind" (4 million), "Rocket Man" (3 million), and "Circle of Life," "Honky Cat" and "Tiny Dancer" (2 million), as well as Rolling Stones Mick Jagger (PRS) and Keith Richards (PRS), who were honored for their rock anthems "Honky Tonk Women," (4 million), "Get Off Of My Cloud" (3 million) and "Ruby Tuesday" (2 million). Who guitarist Pete Townshend (PRS) received a BMI Pop Award for "Behind Blue Eyes," as well as two TV Music Awards for CSI: Crime Scene Investigation and CSI: Miami. Sting (PRS) picked up a pair of BMI Awards, including a 3 million performance certificate for "Fields of Gold" and a Pop Award for "Send Your Love," both published by EMI Music Publishing Ltd./Steerpike Ltd. (PRS). The Lasgo hit "Something," written by Peter Luts (SABAM) and David Vervoort (SABAM), and published by A and S Productions (SABAM) and BE's Songs NV (SABAM), received both a Pop Award and a Dance Award.